Holiday passages . . . .
Years ago I read a book by Gail Sheehy titled Passages: Predictable Crises of Adult Life. My recollection of the content is scanty, but I feel myself swept into a current of life events that feel like “passages”. Some are joyful and sweet, like the new ornament on the Christmas tree. 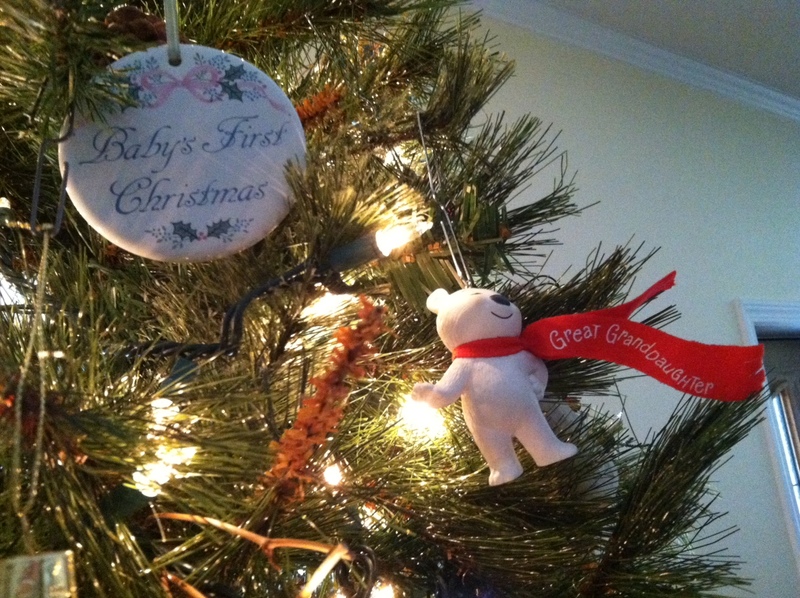 Beside her mother’s Baby’s First Christmas ornament dated 1992 is my newborn great-granddaughter’s ornament dated 2014. Friday, December 19, 2014, to be exact. The baby is exceptionally beautiful for a newborn, and, yes, I AM prejudiced, but even acquaintances agree when they see her picture. Her mother is, likewise, a beautiful woman grown from a beautiful child and married to a really fine and remarkable husband. My heart bursts with joy at the expectation of seeing this young family grow. There is a bittersweet element to my current passage, too. I suppose in many ways I am becoming the matriarch of my family. My age allows it. My status as mother, grandmother, and, now, great-grandmother requires it. Christmases at my mother’s house have been replaced by Christmas Eve at this house. But, am I prepared? Do I have the energy, the focus, the insight to fulfill the role? Do I have the magnetism to bind family ties closer together as my mom and dad did? Can I inspire the devotion to family get-togethers that bonded previous generations? I’m not sure I feel up to the task. I pray that with God’s help I can fill the shoes of the previous “greatest” generation, knowing that it is only with a healthy dose of devotion to God, family, and seasons that I will succeed. So, let us make new traditions that will be as loving and long-lived as past ones, while treasuring the past in our hearts. Previous postThe story of a coat. . . .
Next postA cup of tea. . .